New Cleaner Greener Paraben Free! Ultra smooth for the most sensitive skin. There is never a dull moment with this moisturizing formula. 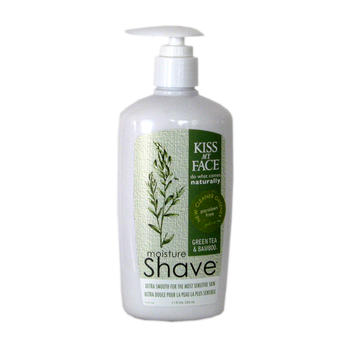 Soothing aloe & olive oil plus anti-aging bamboo and atioxidant greent tea combin to give the best shave. Thanks for making us the #1 natural shave on the planet. Wet hands, lather in palm and apply. Shave and rinse. Aqua, Myristic acid, glycerin, stearic acid, pottassium hydroxide, cocos nucifera, coconut oil, olea eurpaea olive fruit oil, aloe barbadensis aloe vera leaf juice, tocopheryl acetate, retinyl pamitate, allatoin, camellia green tea leaf extract.